What Do Breweries Get Out of the GABF? The Great American Beer Festival (GABF) just wrapped up its latest competition on Saturday. Nearly 300 medals were handed out for beers in 98 styles (! ), which means the exclusivity of medaling has become somewhat diluted. It is no longer uncommon to walk into a brewery and see medals hanging from the wall--after all, more than 2,500 have been handed out over the past decade. In the hours since the winners have been announced, my email account has filled up with breweries announcing their wins--and many of those breweries will go on to tout wins in promotional material, on websites, and in some cases on labels. It's expensive to enter the contest, winning is a crapshoot, and anyway, there are so many medals that a win is likely to get lost in the shuffle. Most consumers don't track who wins these things, and if they learn a brewery has won an award, probably don't care. All of which raises an interesting question. Why bother? Alan Taylor of Zoiglhaus, a two-year-old brewery in Portland. Alan is a German-trained brewer whose Northern German pilsner took gold this year. 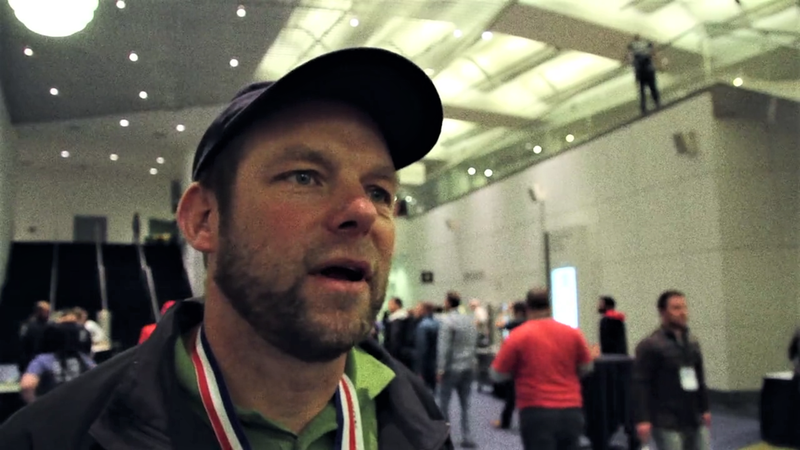 "Over the years, we have won our fair share of GABF hardware [and] we have enjoyed every one. We’ve rarely used these awards for marketing purposes, although we have done it. We enjoy our victories like everyone else, but what it does for sales? Who knows. It doesn’t hurt, but likely helps little in the grand scheme of things." "It seems to have the greatest impact for small or new breweries. I have witnessed some new or unknown breweries benefit from a win. A great example is Central Coast Brewing in San Luis Obispo. Since their recent success at GABF, I have seen a new and well-deserved reverence for their beers locally. One could argue that having a great brewer at the helm of a brewery is the real key to success and that the awards are simply the artifact from that sound business move, but I think it is all linked." "I think it really depends on the breweries size, age, and 'buzz factor' going into the win. For a brand new brewery, a GABF medal is a phenomenal way to kick-start brand awareness, and prove to the seasoned beer veteran that you know what you're doing. For a brewery that's been around for more than a few years I think its a different story. Flat Tail has never been a buzz brewery for whatever reason, so our medal winning doesn't get the coverage that many other cult breweries do." I don't think this is sour grapes, either; Flat Tail's not a one-hit wonder. In addition to awards for other beers, Marliave has now twice won awards in the American sour category, and this follows a novel and unexamined approach he has. When we lost our barrel room due to a contractor error in late 2015, I had to dump over 100 oak barrels of wild beer, some of which were the first 20 batches I ever brewed at Flat Tail. As a result, I was forced to repopulate our sour and wild program in a hurry. I started playing around with fermentation temperatures, vessels, etc. with a few strains of lacto and our house brett strain, and eventually figured out that I could get massive acid development quickly, with a touch of brett character, using a unique combination of fermentation temperatures and tank geometries. The DAM Wild series is a 100% live sour series that hits the shelf for $5.99 / 22oz, only takes 4 weeks to brew and bottle, and has won a GABF bronze, World Beer Cup Bronze, and now GABF Gold in the 22 months since we first launched. "If you win a medal for a beer that is a major player in your portfolio that you sell, it can be helpful. You still need to market the win of the beer to the consumer, distributor, and retailer, which means you need to invest further marketing dollars and time to this. 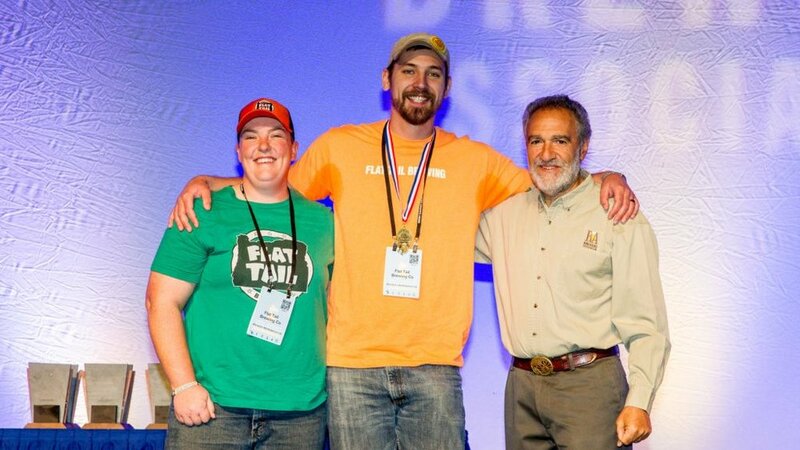 Winning medals at GABF brings attention to your brewery, which creates conversation in the industry and might help you to build your overall brand in a indirect way." "It can be useful to see how you stack up. The feedback I am most interested in for this purpose, however, is the Judge Tasting Sheets which gives detailed info from each judge. These sheets also indicate if the beer advanced to the 2nd round. It is nice to win a medal but, as I tell our brewers, if a beer advanced then it is a pretty solid beer." "You also have the opportunity to taste the winning beers and learn more about how winning brewers are approaching the different styles. If you have the opportunity to judge the event, you are able to tap into an even deeper resource of information and see what makes a winning beer. The vast majority of brewers continue to support and compete in the GABF because it is a great opportunity to network and gain knowledge that you can take home to make your beers better." Four of the six breweries I spoke to used the phrase "stacks up"--as in, how a brewery's beer "stacks up" against others nationwide. Josh Pfriem points out that participation not only allows breweries to see where their beers stand relative to the market, but what the market actually looks like. All that information gets folded into the learning breweries take back home. I think the real strength of beer competitions as a whole is that they drive brewers to make better beer for the consumer. It is a way to see how your beer stacks up next to your peers, and also to find beer that inspires you. GABF is great because you get to join your peers during the award ceremony and then you go get to try award winning beer right after the ceremony. From a brewers perspective, this is one of the most important parts of the competition. Whether you medal or not in a category, you can go and try the beers that did medal and see how your beer stacks up. All this to say, I think beer competitions drive brewers to make better beers. That said, we shouldn't get focused too exclusively on the high-minded information-gathering aspect of the competition. Winning is its own reward. Finally, two brewers mentioned some of the limitations to competitions that give them pause. Alan Taylor, who is so busy he doesn't have time to respond to emails, called me on the way home from a long day in the brewery. He has ambivalence about contests in general ("like my stance on the Purity Law"). To paraphrase, he told me that it's such a crapshoot. "Russian River won ten medals or something one year and was named brewery of the year, and the next year they didn't win anything. That's a great brewery!" Taylor is also involved in a long-running grievance with the Berliner weisse category. Taylor, educated in Berlin, has made a careful study of historic Berliner weisses. This included study of the microbiology of old bottles from Schultheiss. Brettanomyces played an important role in building the typical flavor of this style--one far more complex than mere lactic fermentation can provide. But the GABF rules still stipulate Brett is inappropriate. So, to his frustration, he says, "I don't think our Berlinerweisse will ever win an award. I like to spend money to be told Brett shouldn't be in a Berliner weisse." Update. Apparently Alan's long crusade bore fruit. The 2017 Guidelines now include this note for Berliner weisse: "Brettanomyces character may be absent or present at low to mediumlevels, and if present may be expressed as horsey, goaty, leathery, phenolic, fruity and/or acidic aromasand flavors." (My understanding is that they "typical flavor" of Berliner weisses is not so much the classic Brett character, but the results of its activity in converting the acids produced during lactic fermentation into fruity esters--but that's a debate for another year. Alan Taylor at Zoiglhaus Oktoberfest, which happened the day the awards were announced. Photo by Sandra Clark. "The reality is that beer judges take tiny sips of beer and try to imagine how that beer would be as a whole beer. A really good beer judge can do this and pass amazing beers to the final round, but not all beer judges are created equal. Some years when evaluating our beers against ones that medaled in categories that we entered, I am like, 'Wow, that's an amazing and inspiring beer! I totally get while that medaled!' Other times it can be very frustrating and challenging: 'How did that beer get to the medal round?'" On balance, the reason breweries enter competitions--particularly those with qualified judges and deep competition pools--is because they learn so much when they do. There may be some downstream opportunities to use a medal to promote their beers, but this isn't the central reason most breweries compete. Plus, it's pretty sweet to cruise around that final sessions with a medal hanging around your neck.